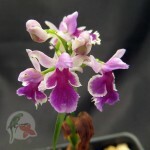 Poneorchis graminifolia is a terrestrial orchid from Japan. 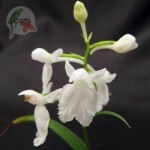 Like Habenaria, it grows from a small tuber that pops up in the spring and dies back in the fall. Grow it in a well-drained mix such as African Violet mix or a mixture of seedling bark and sphagnum moss. When it pops up in the spring, begin to water lightly. As the plant grows, provide enough water to keep moist. Flowers will appear mere weeks after the plants come out of dormancy. In autumn, the leaves turn brown, and the plant slowly withers. Cut back on water at that point. You can overwinter the tuber in its pot or remove the tuber and overwinter it elsewhere. The key is to keep the tuber from drying up completely OR turning to mush. My friend suggests that if you overwinter in the pot, plant a piece of wandering jew in the pot, too. 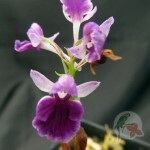 If you water just enough to keep the vine alive, that will provide sufficient water for the Poneorchis tuber to be happy. Alternatively, you can remove tubers to a plastic bag with a bit of moss and keep an eye on them; mist as needed. 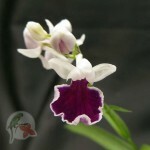 The payoff for this care is beautiful little plants with a fascinating array of flower colors and shapes. In the dozens that I have seen, no two plants were alike. Because the plants are prone to breaking in transit, I am only shipping THIS WEEK and maybe next week depending on growth. 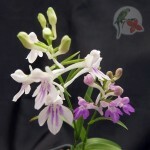 Which of the Poneorchis do you have available? Only saw one in your main plant listing. Thanks.